Product meets market: Dengen Chronicles is finally online! Today was what I call a good day on the job. Not because of any particular achievement, don’t get me wrong. Just, this is how I love my job. In my role as an associate in an eclectic firm such as dPixel I tend to have quite a few hectic days, but today is a very VC day. Fundraising proceeds heavily with a few of our portfolio companies, while others are working heads down on developing their own products and markets. I love when product meets customers and the magic starts to happen, so I am particularly proud of today’s announcement by Mangatar’s team: after a few months of heavy development, of brainstormings, of pain and fun, they are finally announcing their new game: Dengen Chronicles. I follow them closely so I know the efforts they’ve put into this game. I also know that I’m having fun playing with DG - even though there are still a few rough edges here and there. Curious about trying it out? It is already available on the Chrome Store! I’ve been heavily on the road in the last few weeks, either on the Barcamper, chasing potential investments or joining startup events up & down Italy. Since I’m pretty sure lots of people are either waiting for an email or wondering where the hell I am, I suppose it can be useful to post a short recap of my next moves. Tomorrow (21/6) I’ll join the Top-IX team at one of the Big Dive open events in Turin. It will be interesting to listen to a few pitches of BigData-related startups, while my personal contribution will be a brief presentation of the Working Capital program by Telecom Italia. Next week I’ll be in Potenza on Monday (24/6) (prepping up teams&presentations for Techgarage Basilicata) and in Trento on Tuesday 25th, meeting the great guys of TechPeaks. On July, 3rd, come meet me and the rest of the dPixel Scouting Team in Naples for a #WCAP event with the Barcamper. If anyone in Sardinia wants to meet-up, I’ll be on the Barcamper during the Sardinia innovation Tour, in the week 8th - 12th of July. Now you know why you are not getting any emails. Please bear with me. The coming months are going to be quite fun, since Italy will be host of a few Startup Weekend events. The first one is taking place in Cagliari from the 10th to the 12th of May, 2013. I am honored to sit in the jury with legends such as Renato Soru, Mario Mariani, Massimiliano Magrini. Last weekend I was invited to join a bunch of great people for a traveling event in Abruzzo, a region in Central Italy, named StartHope. The event is part of a startup investing program that is being setup by FIRA, the regional investment office of Abruzzo. 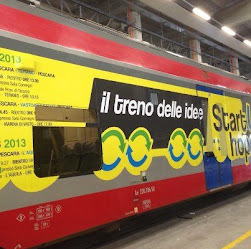 In brief, FIRA “branded” a train (see picture) and organized a travelling “scouting / Q&A” team to meet aspiring entrepreneurs and chat about creating new ventures. The train touched a few of the main cities in Abruzzo (Pescare, Teramo, Vasto, L’Aquila). It was fun - not only there where great people on the train (from Mangatar’s Raffaele Gaito and Andrea Giannangelo, founder of Iubenda, to Andrea Di Camillo, angel & professional investor - but the FIRA team pulled out a magic trick and managed to fill up the train, with more than 250 people registering their interest to get onboard: many of them with ideas to propose and the sane curiosity to understand how to fund their projects. A few of those I met are actually worth a second meeting. Way to go, FIRA, the demonstration that public-owned investment offices can organize excellent events, animate a startup community and, why not, position themselves as a reference point for aspiring startuppers. It has been a while since my last adventure into blogging. I took the opportunity for some weekend coding to put together and update a bit my blog, so that at least I am not embarrassed by it. This little piece of ugly code is an attempt to test the combo GitHub + Heroku + Rails. As usual, add ViM to the mix to find perfection.